Ok, you know the food at Marseille is always going to be good, especially when it’s the annual Stinky Cheese Festival, but what’s always interesting to the Accidental Locavore are the people I meet at these events. How often do you get to eat stinky cheese sitting across from a very interesting and attractive redhead who happens to be a Lt. Commander in the Navy? After flying missions and serving in Afghanistan, she’s now here doing PR for the Navy (and checking out all Manhattan’s best food) before taking a new post attached to a battleship out of Seattle. Needless to say, it made for fascinating conversation over a great dinner! We were invited by Sy Rahnman, the manager to the kick-off dinner for one of my favorite annual events, the Stinky Cheese Festival. This year, there was a new twist to the dinner, with Marseille’s sommelier pairing likely and unlikely wines with each course. Dinner started off with an amuse-bouche of gougères with Parmesan and sea salt. Although I’m about to go on an anti-salt-added-to-everything rant (stay tuned), this time the salt did give a nice dimension to some great gougères. If I hadn’t known there were many courses to come, I could have inhaled the entire basket! However, my old favorite, raclette, was about to make an appearance, so I restrained myself. The raclette was served as an appetizer, melted over slices of potato, garnished with mushrooms and cornichons and topped with frisee. The raclette was lovely and was perfect with the potatoes. My “cornichon” was actually half of a large caper berry, which was an interesting twist on the classic. Paired with the raclette was a sparkling Cremant d’Alsace and a Riesling from the Finger Lakes. 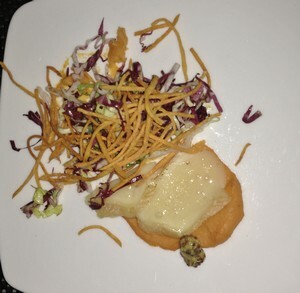 Next up, a truly stinky cheese – Vacherin Mont d’Or oozing itself over a sweet potato puree with whole grain mustard to cut the richness and a salad of mustard greens and thinly julienned sweet potatoes. The sweet potato puree was a distraction from the Vacherin and the two textures – ooze and puree – were not terribly complementary. 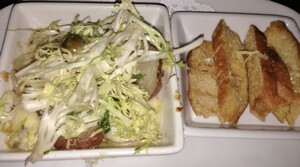 The cheese was great with the salad and everyone at my table preferred the julienned strips of potato. To drink, a Macon and a Valle d’Aosta, both of them great choices with the Vacherin. 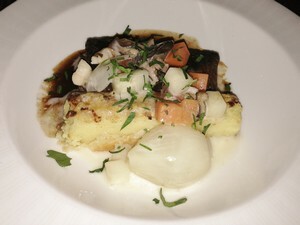 For the main course, Epoisse graced a short rib bourguignon, with root veggies, bacon and a reduction made from the Epoisse and cabernet. French Morning just voted Marseille’s boeuf bourguignon one of the five best in New York, and adding the Epoisse to it only made it better! This time, one of the beverage choices was a Belgian-style beer made locally, along with a lovely Bordeaux, which my table preferred. Dessert, and yes, we made it that far, was profiteroles with a Roquefort ice cream and a red wine caramel. I love Roquefort and I love ice cream, but I did not love Roquefort ice cream. It was terrible on its own, but better tamed by the profiterole and caramel. My preference would have been for a nice wedge of cheese, followed by (plain vanilla) ice cream with the caramel. A Banyuls, along with coffee and teas, made a nice ending to an interesting and delicious dinner.